Pasalubong is a Filipino tradition of giving a homecoming gift after a vacation or a trip. It can be fancy and expensive—on a trip to San Francisco in 1994, I splurged on a Lladro piece for my mom to add to her collection. And, it can also be something affordable yet appropriate— lip-gloss for my nieces who are in their tweens. When I was younger, my father would have pasalubong even when he just went to work. Not all the time and nothing extravagant, but he would bring home something that he would pick up from the school cafeteria– usually, candied peanuts or meringue. When he would travel around the Philippines (and he did it a lot! ), the only thing I would ask from him as pasalubong are the packets of milk, sugar, and coffee handed out in airplanes. Never mind the dried mangoes from Cebu, pili nuts from Bicol, durian pastilles from Davao, or strawberry jam from Baguio. I go straight for the powdered sachets! The whole idea of the pasalubong is to make the recipients know that you thought of them while you were away. Pasalubong can be store-bought or homemade. Hands down I prefer homemade treats over key chains, snow globes, and teaspoon souvenirs. 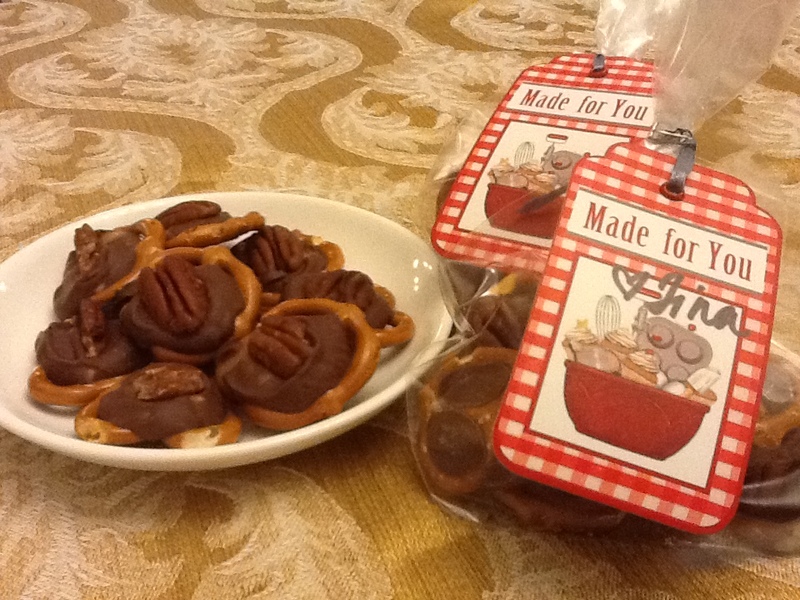 Here is a perfect pasalubong recipe that was shared by a blogger-friend. The recipe can also be found in a bag of Rolos (a chocolate caramel candy). I have packaged them in big tin cans for when we visit friends. I have handed them out in clear cellophane bags as party tokens. I have also served them in candy dishes. 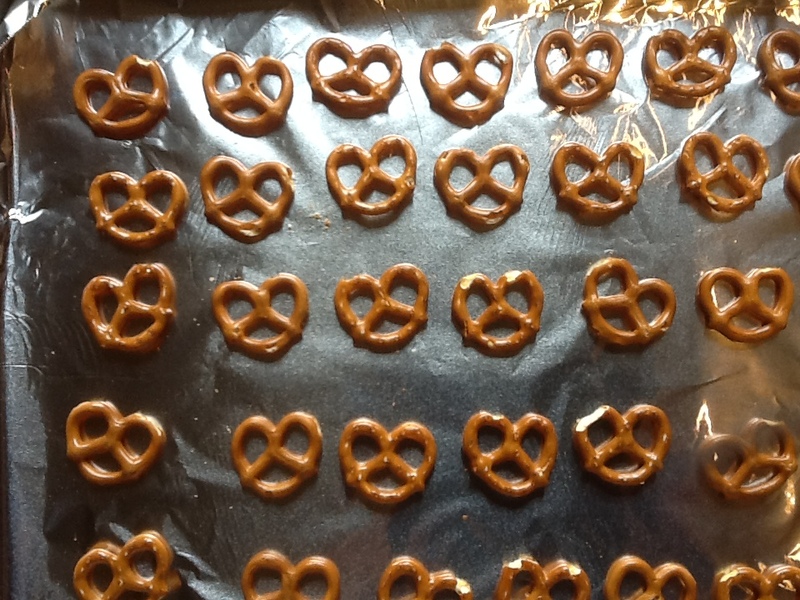 These rolo pretzels are always a party hit! On a trip to Manila, I brought all the ingredients and assembled them there. I have to warn you though that these treats are very addicting. Preheat oven to 300F. 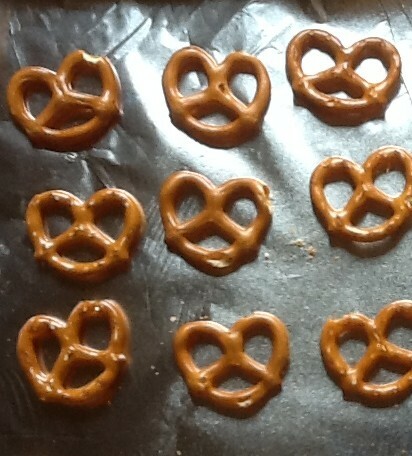 Lay single layer pretzels on a cookie tray lined with parchment paper (or foil). Unwrap the rolos and put a piece on each pretzel. Bake for 4 min. Take out the tray and place 1/2 a pecan on the warm melted candy. Completely cool (put in the fridge to speed up the cooling process). Keep in an airtight container. Posted in Filipino Custom and tagged caramel candy, cooking, cooking with chocolate, dessert, family, food, Hershey's, parenting, pasalubong, pretzel, Rolo, treats. Bookmark the permalink. Everyone who knows my family well knows that my son’s favorite breakfast is champorado. It is made with sweet sticky rice, water, and chocolate. Everything is boiled together until porridge consistency. 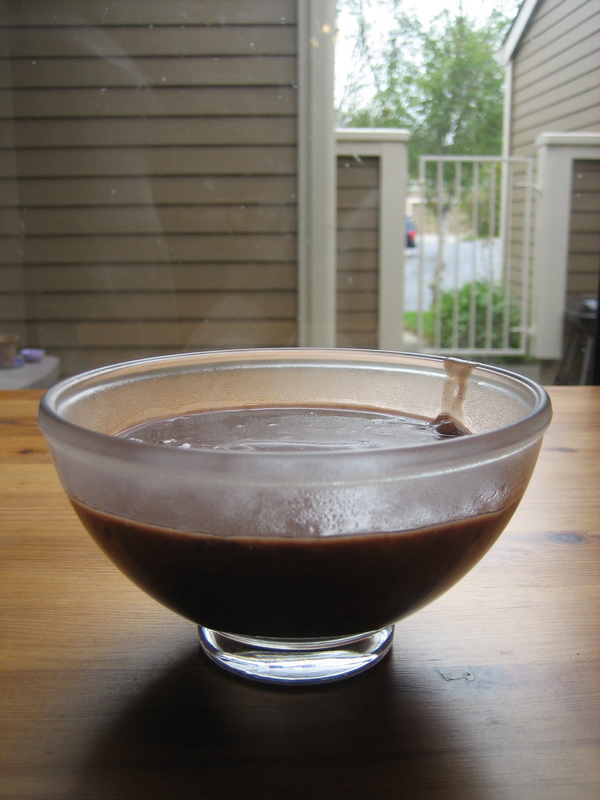 Depending on the kind of chocolate used, sugar can be omitted or added. I can’t remember when I first cooked it for my son, but I am sure he had it even before I allowed him to eat sweets. I would let him eat as many bowls of champorado as he wants, and yet I would not allow him to eat a single chocolate bar. It does not make sense, I know. I was convinced then, that by allowing him to eat champorado, I was helping him create a memory of enjoying a Filipino dish that would last him a lifetime. If we were in Manila, we would eat champorado with crispy dried fish–tuyo, danggit, or sap-sap (my favorite). The contrast of the saltiness of the fish compliments the sweetness of the chocolate meal. Although I could find a variety of dried fish in the local oriental store, I have yet to try one processed in California. Instead, I use another complimentary side dish–Bacon! I broil applewood smoked bacon to a crisp. It offers that same balance in taste as the salty fish (obviously, with more cholesterol). I have used Antonio Pueo’s tablea and Bohol Bee Farm tablea. Good friends who know that champorado is a favorite of ours have brought tablea from Palawan and Davao as pasalubong (thanks, Raquel). But if in a bind, I use plain and simple chocolate chips (Ghirardelli, Hershey’s, Trader Joe’s). They work just as well. In a pot, bring everything to a boil. Stir regularly to prevent the rice from sticking to the bottom of the pot. Once rice is cooked (approximately 20 minutes), turn off heat. Because of the glutinous rice, the mixture will become very thick (malapot) after it cools. Mixing a little bit of milk will help with the sticky consistency. Condensed milk is perfect to be used if tablea is the chocolate preference. Otherwise, use regular or non-fat milk. 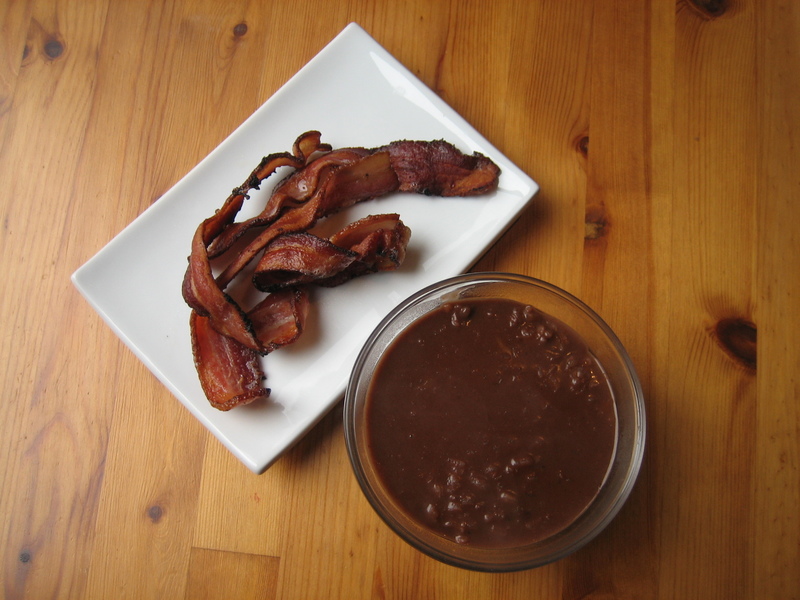 Posted in Filipino Recipe and tagged Antonio Pueo, breakfast, chocolate chips, cooking with chocolate, dried fish, filipino dish, Hershey's, sweet sticky rice, tablea, Trader Joe's. Bookmark the permalink.